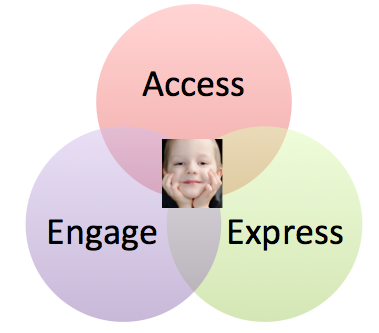 Access, Engage, and Express (TM) is the lens for understanding how anyone learns best. The reason we came up with these three words was to help educators easily understand their learners using this lens. We want Access, Engage, and Express to be an integral part of their daily approach to teaching and learning. Using Access, Engage and Express was developed from the Universal Design for Learning® (UDL) principles that are based on neuroscience and how we learn. "UDL is the framework for Personalized Learning." The Center for Applied Special Technology (CAST) developed UDL based on how each learner is unique and has variability in their learning. Neuroscience takes into account how individuals bring a variety of skills, needs, and interests to learning. The biggest point we wanted to make was that this lens is for all learners. It is about teachers understanding how learners access information, engage with content, and express what they know and understand. We also used this lens for the learner to understand how they learn best. This lens validates the learner and it prompts conversations about their learning between the teacher and learner. Think about yourself and how you access and process information. How do you transform information into useable knowledge? When we asked teachers this question, their answers were all different. Some told us they needed pictures that illustrated the text or written step-by-step instructions. Some said they needed to do their own research online. What about you? What about your learners? How do you think they best access information? Next think about how you best engage with content. We are all different when it comes to how we are comfortable engaging with content. Some teachers told us they learned best by doing hands-on activities. Others stated they learned best by working alone and reflecting on their learning. Others needed to collaborate with others. What about you? Again think about your learners and how they best engage with content. Now think how you express what you know and understand. Some people felt better writing down what they learned. Others felt better creating and building things that demonstrated what they learned. Even others stated they felt more comfortable presenting in front of others. What about you? How do you best express what you understand? All of this made it clear to us if we broke it down to practical terms, it would make sense to educators and learners as the lens. Easy to understand. Clear to use. Universal Design for Learning is a registered trademark of CAST.